Pale? It’s called porcelain and I’m rockin’ it! 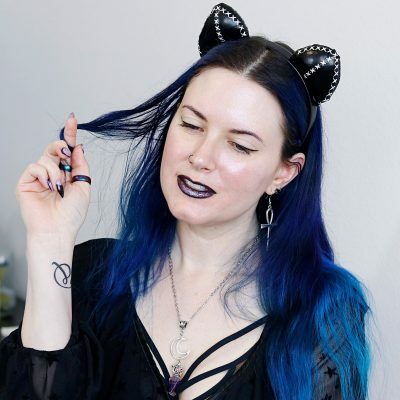 Hi, I’m Courtney, the person behind Phyrra.net and PhyrraNyx on Youtube. I’m a published author and beauty addict. I started blogging in 2008 and went cruelty free in 2012. I share honest reviews, how-to’s, tips and more to help you be fearlessly beautiful. I specialize in pale girl beauty, hooded eye makeup, cruelty free beauty and gothic fashion. I also share lifestyle tips, too. I just published a book called Hooded Eyes Makeup Manual, exclusive to Amazon! I love bright makeup, colorful hair, and sparkly nail polish. I have oily, hooded eyes and believe in the power of eyeshadow primer. My skintone is between N0 – N5 (see the Best Foundations for Pale Skin). I have sensitive, dry skin with rosacea. My hair is naturally a step off from black, straight, fine and color treated. I’m 5’4″, petite, and curvy. I follow a low carb low sugar high fat lifestyle. My fashion style has been described as post-Modern Faerie. I love spikes, studs and Swarovski crystals. Edgy, yet feminine gothic fashion is my favorite. I have two dogs – a standard poodle named Phaedra who is my best friend, and a new baby standard poodle named Nyx. I’m passionate about animal-friendly products! I’ve also started incorporating more environmentally friendly products too. Series to Get You Started! Love cruelty free beauty? Show it with a Phyrra shirt! Or get Phyrra delivered daily by subscribing via email.